In the Netherlands this year 35.694 children went to school in a climate-friendly way. In the activity week on sustainable mobility the children collected 190.837 Groene Voetstappen! This means the Dutch children walked around the world 7,7 times, in one week! In some of them the children collected more than 25.000 Green Footprints in one week! In Heerhugowaard the children held a parade with face painting and music, to highlight attention on safety around the schools. The primary schools in Helmond had a very special guest to motivate the children to go green: the environmental superhero Mr. Green! At the start of the activity week Mr. Green visited ten schools to encourage them to collect "Groene Voetstappen"
And at the end of the week he attended - together with the alderman of education - the presentation of the trophy for the best school. 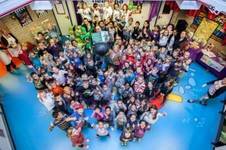 The local Greenpeace group participated the program by educating about climate change at the primary schools in Hoofddorp. This resulted in two very nice days with enthusiastic children and teachers and a lot of Green Footprints in the next week. The kids had many ideas to reduce de use of the car and therefore energy. Later, the children offered the Green Footprints to the local councillor and did a real 'Greenpeace Flashmob' to raise awareness for environmental issues! At the 26th of November 2012 starts the 18th UN Climate Change Conference in Qatar, in the Middle-East. During this annual conference negotiate Ministers and senior officials from many countries to reduce greenhouse gas emissions. Of course, children can do that as well! Dutch representatives of all children who have gathered Green Footprints, are attending the "Kinderklimaattop" in The Hague. At their conference the children talked about important issues, such as climate change and discussed their ideas to counter the further global warming. At the end of the summit, the best idea has been offered to Hugo von Meijenfeldt, who represents the Dutch government at the UN Climate Summit in Qatar.